Intelligent Transportation Systems (ITS) technologies can be applied quickly and effectively to improve the safety of all types of roadways, including rural and local roads. ITS is the application of information processing, communications technologies, advanced control strategies, and electronics to the field of transportation. In addressing local and rural road safety issues, ITS should be considered as an effective strategy. Today, devices are available that are ideal for rural roadways, including restrictive rights of way with limited access to local power or lack of a telecommunications infrastructure. The purpose of this Briefing Sheet is to describe ITS concepts and to present examples of low-cost ITS applications that improve safety and operations on local and rural roads. An investment in ITS applications can be an effective solution to an existing safety problem. Rural agencies can use ITS solutions to improve the overall safety and operational effectiveness of their systems with minimal impact on maintenance or construction funds. In general, agency resources are limited; decision-makers and agency personnel may struggle to meet their roadway safety and other needs. Rebuilding infrastructure is a costly undertaking, and larger scale improvements, although having a high degree of effectiveness, may not be affordable with limited budgets. In rural areas, pinpointing specific crash hot spots may be difficult due to crashes being scattered; however, similar types of crashes can be identified. Deploying low-cost ITS technologies through a systemic approach can be highly effective for reducing high-risk crash types. ITS bridges the gap by delivering proven, cost-effective safety benefits that can fit within limited budgets while easing the impacts on other basic roadway maintenance needs. The components used for many ITS devices are being constructed on a scale that makes these devices ideal for two-lane roadways. There are three main areas that impact deployment on local and rural roadways: power, detection, and communication with devices in the field. Importantly, supporting or maintaining these devices does not necessarily require agencies to have specialized expertise on staff. While ITS devices do rely on electricity to function, the electrical grid is not the only source of power. 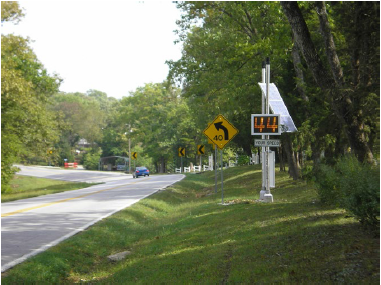 Solar power allows practitioners to adapt installations to small or constricted roadsides, which are common on many local and rural roadways. Using portable batteries and solar power reduces the expenses related to hooking up to local power and allows significant flexibility in selecting devices to meet the specific operational requirements of a location. Detection components may be used to locate vehicles, pedestrians, and other transportation modes. The detection function can activate devices to display message signs or flashing beacons that warn of dynamic situations in real time to the driver. Detection can be used to measure speed, collect traffic volume, and classify the composition of traffic. Detection components can include magnetic, microwave, piezo-electric, acoustic, radar, ultrasonic, and infrared equipment as well as vehicle probe data. Communication allows data to be collected and transmitted between components and can be used to monitor and control devices remotely. Hardwired components are still used, but wireless communication is ideal for rural applications. Data exchange between components may be transmitted using any of a number of other common technologies, including cellular, pager, radio, satellite, hard-wire, or fiber-optic cable. Next Generation of ITS. In the future, connected vehicle technologies will be used to enable vehicles to communicate with roadside devices to improve safety and operating efficiency. Connected vehicle technologies are emerging tools in the transportation field that use Dedicated Short Range Communications (DSRC). DSRC will allow vehicles to integrate with infrastructure on the road or with other vehicles to improve safety and operations by adjusting to changes in alignment, traffic flow, or emergency situations. How can ITS Improve Roadway Safety? The distribution of fatalities on rural two-lane roadways shows that the bulk of the problem lies with local roadways, particularly local and county operated and maintained roads.1 ITS applications have been developed to help address safety problems related to intersections, curves, and speeding. These three circumstances account for 40 percent of crashes on locally owned and maintained roads. Curves and Speeding. Curves contribute to 29 percent of roadway fatalities on local and rural two-lane roads, while speeding contributes to 34 percent of the roadway fatalities on these roads. Dynamic signing has proven to reduce lane departure crashes. For example, speed feedback signs, flashing chevron signs, and changeable message signs can alert drivers to adjust their movement. Speed feedback signing can warn drivers to reduce speed. 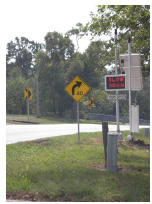 An example of a speed feedback sign is shown to the right of the curve warning sign in in the photo above. The electronic sign is showing the driver of the on-coming vehicle what their operating speed is, allowing the person to adjust speed as necessary to obey the recommended 40 mph advisory speed. 1 NHTSA, 2011 Fatality Analysis Reporting System. 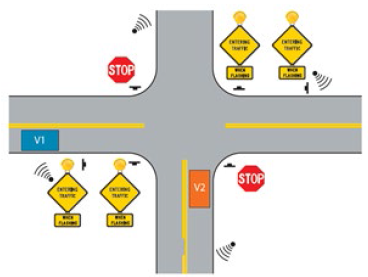 2 Minnesota Department of Transportation, Rural Intersection Conflict Warning Systems Deployment Concept of Operations, October 25, 2012.